It all started last fall. I had all these brilliant cravings for pumpkin dishes floating around in my head. Unfortunately I didn't have enough pumpkins to make them all a reality and the pumpkins in the markets left much to be desired. I vowed that in the spring I would plant enough pumpkins in the garden to make all those dreams come true. One thing led to another and as winter dragged on, plans began to take shape, growing larger and larger as my desire for the warmth of summer grew stronger. Promises in winter are easy to make, but hard to keep. Then, one cold-but-not-too-cold day in February, we moved the garden fence across a barren plot of yard that would become our pumpkin patch. There was life in that frozen soil, I just knew it. But spring came late and often I found myself gazing out the frosted window at the garden, covered in silver snow, still sleeping when I was ready to run out there and yell, 'Wake up! Wake up!" The seeds, tucked away in their paper envelopes, waited more patiently than I by the back door, until the first warm(ish) day finally arrived in late May, and the snow once-and-for-all disappeared from the shady back corner. I was out early, sectioning and turning over the soil in the new patch of garden. Then, just as planned, I planted the three sisters - corn, pole beans, and of course, pumpkins - in small alternating mounds, as I'd read it was done centuries ago by Native Americans. But, you see, I'm a pumpkin novice; I've never grown them before. And I discovered a few things. 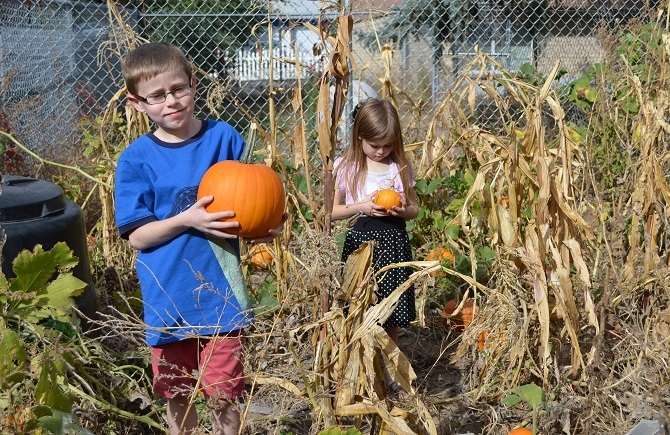 For one, you don't need a lot of plants to get a lot of pumpkins. Two or three mounds would have been more than enough. (I planted 12!) Secondly, they like to spread. And by spread I mean scale fences, climb trees, and wiggle through the cracks in stone dividers, no matter how small. So now I find myself in a very different place than I was last fall, gastronomically speaking - though many would argue that you can never have too many pumpkins! 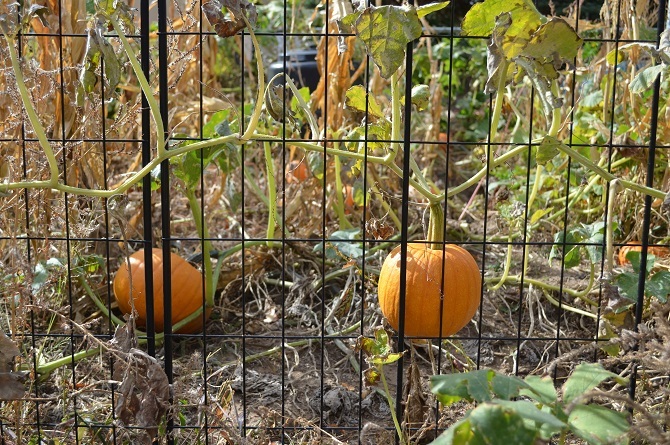 Most of the pumpkins are still out in the garden, hardening off and waiting, patiently again, for the first frost. Maybe tonight! But I just couldn't help myself have picked a few over the last several weeks. How can you go through October without a little pumpkin spice in your life? One night I roasted them with maple, garlic and mossy sage from the garden, to be served alongside a roast chicken. I made pumpkin black bean soup the next afternoon, with big chunks of buttered bread for dipping. And we're on our third batch of pumpkin scones, sticky with brown sugar cinnamon glaze. Not to mention I've put 5 bags of puréed pumpkin in the freezer! Of course, there will be a salted caramel pumpkin spice cake very soon. It's a family favorite! And pumpkin breads, savory tarts, ice cream, soufflés, risottos & ravioli throughout the winter! Maybe even a pumpkin pie for Thanksgiving. How dreary winter would be without the warm flavours of pumpkin, cinnamon & spice to get us through! Stay tuned! 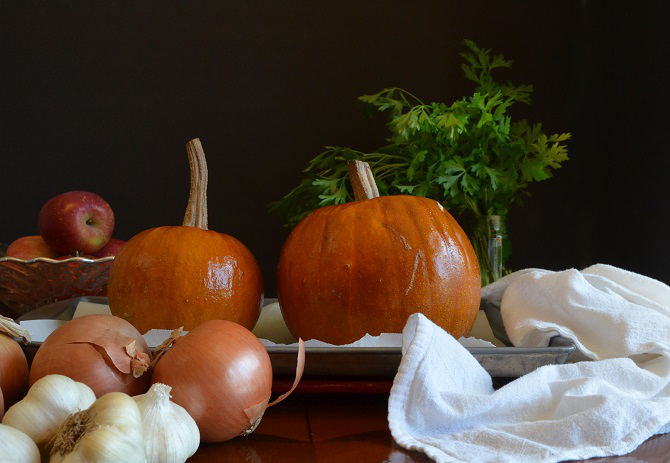 Along those lines, did you know that you can cook pumpkins whole? I didn't until I started doing some research on google after a freak kitchen accident. It happened as I was slicing the pumpkin to be roasted with maple and sage. I impaled the palm of my hand while trying to cut through the tough skin. The funny thing is that I didn't cut myself on the knife, no - but rather on the sharp edge of the pumpkin skin itself! 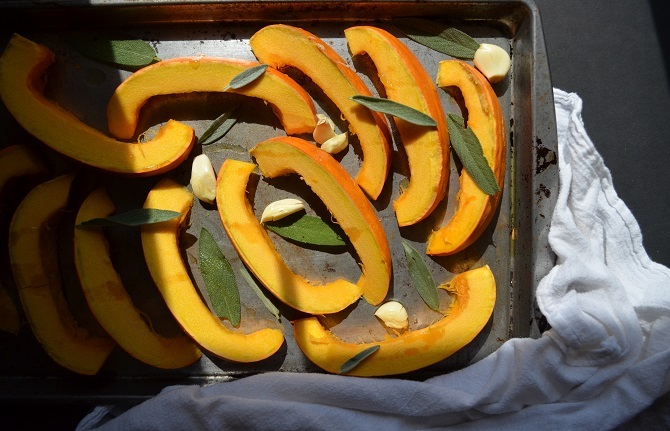 To roast them whole, just clean the pumpkins and coat with a little olive oil. Place them on a parchment-lined pan and bake for an hour or so at 350 F. Test with a fork to see if the flesh is soft. Remove and let cool until you can comfortably handle them. I was worried that the seeds would be difficult to remove after being cooked, but they weren't. The pumpkin slices like butter and the skin literally peels off! Preheat your oven to 400 F (200 C). 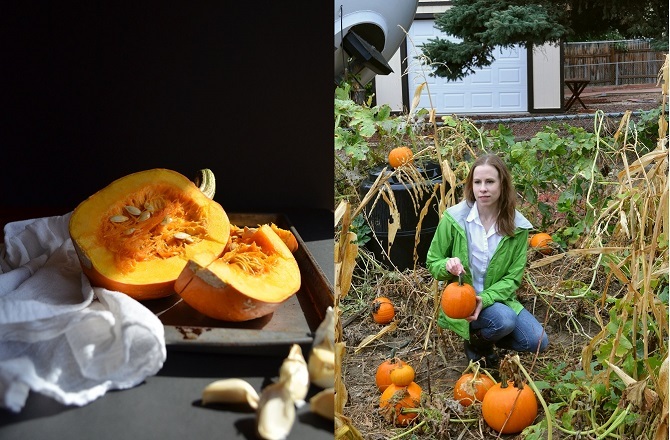 Cut the pumpkin in half and remove the seeds. Cut each half into 12 slices. Place on a baking sheet with the garlic and sage. Drizzle with the olive oil and sprinkle generously with salt and pepper. Toss with your hands, and spread in an even layer. Bake for 35 - 40 minutes, stirring halfway through. 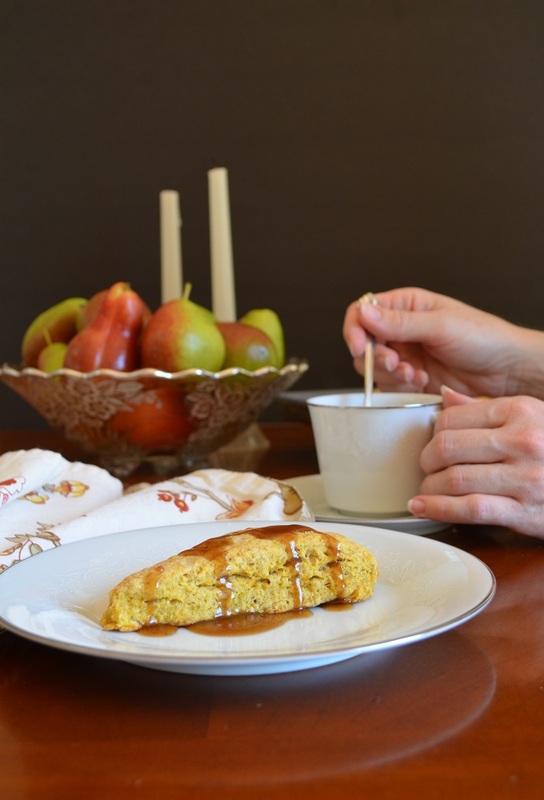 Brush the pumpkin with the maple syrup and bake another 10 minutes, until the syrup is caramelized. Serve warm. Preheat the oven to 400 F (200 C). Line a large baking sheet with parchment. In a large bowl, mix together the flour, spices, baking powder, baking soda & salt. Add the butter and cut it into the flour with a pastry blender. In a small bowl, whisk together the pumpkin, honey, milk, egg & vanilla. Stir this into the dry ingredients. Knead the dough a few times in the bowl, then place it on a heavily floured board. Roll the dough into a circle that's approx. 3/4 inch thick. Cut the dough like a pie into twelve triangles. 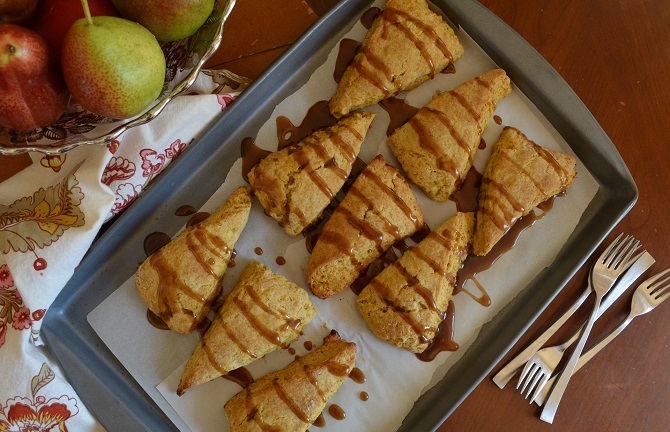 Place the scones on the baking sheet and bake for 11-12 minutes. Allow to cool slightly before glazing. To make the glaze, melt the brown sugar and butter together in a small sauce pan until bubbling. Add the milk, vanilla, cinnamon and salt and bring to a simmer, stirring constantly. Simmer for 30 seconds to a minute them remove from the heat. Allow to cool slightly before drizzling over scones.